Ghost Blitz is the only game in my collection that I bought based on playing the app. (The Android app is excellent, by the way.) Speed games aren’t everyone’s cup of tea, but Dutch Blitz is a staple in my family, the focus of many tournaments and the cause of many Band-Aids. So where does Ghost Blitz fit into the speed/dexterity canon? Read on for my appraisal. 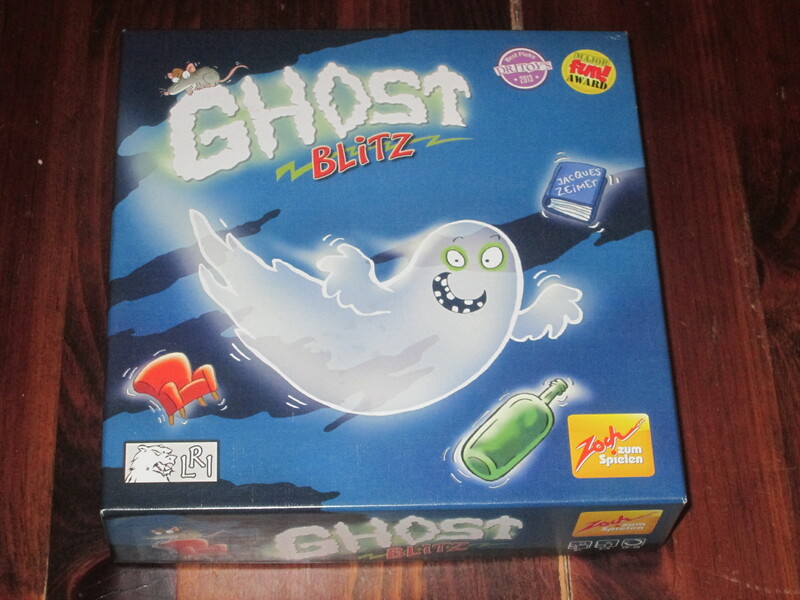 Ghost Blitz is a recognition and reflex game for two to eight players. Players try to be the first to grab the indicated object to win cards. The player with the most cards when the deck runs out is the winner. Ghost Blitz set up. Seriously, that was easy. 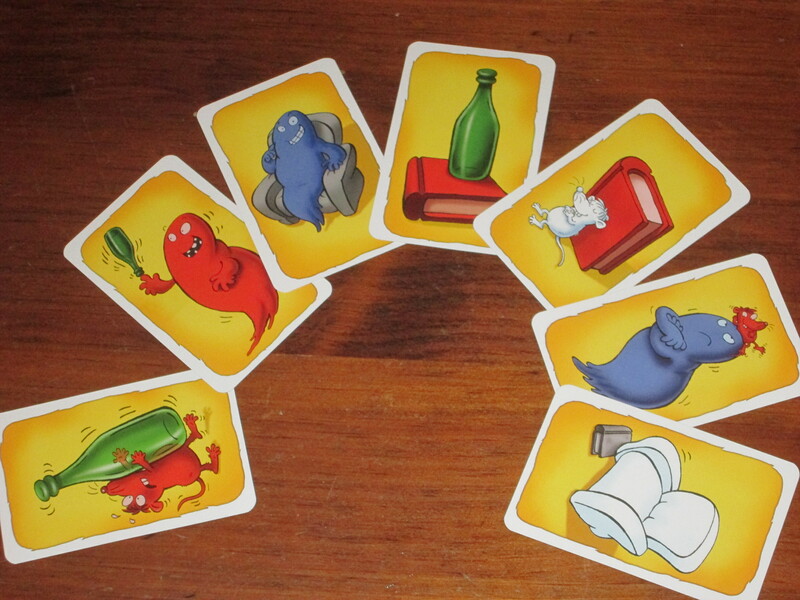 Once the card is flipped up, players try to be the first to grab the correct object (and may only grab one object). The first player to grab the correct object claims the card. If anyone grabbed an incorrect object, they must give the player who grabbed the correct object one of their previously won cards. Play continues until the deck runs out. At that point, the player with the most cards is the winner. Fast and Furious, or Slow Ghost? Perhaps no genre of games is as polarizing as speed dexterity games, games that reward quick reflexes and often quick processing of information. Set, Dutch Blitz, Spoons, and Egyptian Rat Race (as my youth group euphemistically referred to it) all attract a certain kind of player. They are each games that produce thrilling amounts of adrenaline–or acute feelings of inadequacy–as, time after time, you’re just this side of fast enough. So I’ll acknowledge right off the bat that Ghost Blitz is that kind of game. But you still might like it. Ghost Blitz doesn’t look like much on paper. At first the game seems so simple. “Look at the card; grab the right object; yawn.” Then, when you try to explain it, it seems so difficult. “Grab the object that matches the color and object. Unless there isn’t one. Then you want to grab the object that isn’t on the card, and whose color also isn’t on the card. Oh dear.” It usually takes me walking new players through a few sample cards before I get tentative nods that we can begin playing. But players usually catch on quick. Some cards from Ghost Blitz. All of these cards point to the green bottle. To the rules, that is. The gameplay? That can be a bit of a stretch, but that’s because the rules stretch your brain in different directions. And that’s what makes the game so much fun. 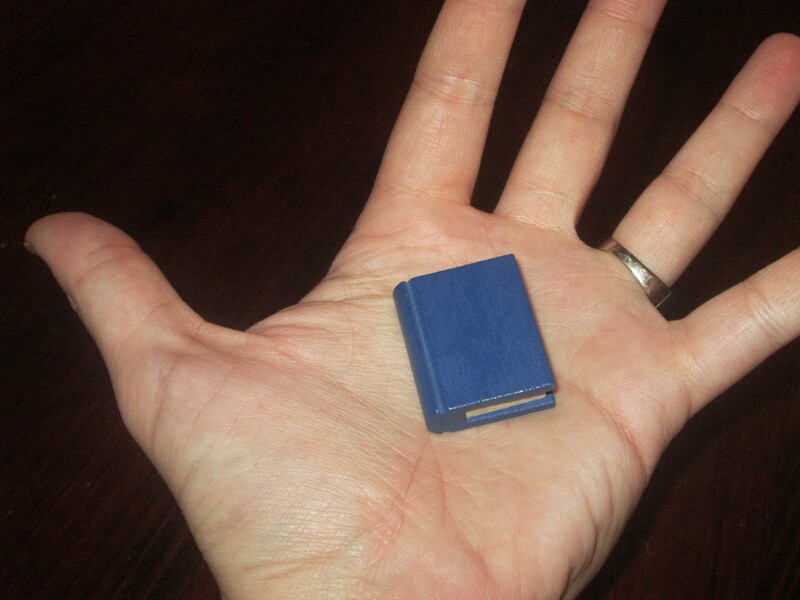 In one instance, you want to grab the object that’s on the card. In another, you don’t want to grab the object on the card, but there are three objects not present on every card, and you have to eliminate them one by one. Then you grab for something, but darn it! Another player beat you to it. Or darn it! You grabbed the wrong object. Because the game involves so much mental processing, and the mental processing required switches from one card to the next, and this is a race against other players, it’s hard to keep your bearings. And that’s one of the great things about this game: even good players slip up. I’m pretty decent at the game (at least among those I’ve played with–I’ve yet to test my skills at a convention), but there are still rounds where I grab the wrong object, or I sit for a full twenty seconds to determine what object the upturned card is asking for while another player beats me to it. My niece and nephew don’t often beat me on the draw, but when they do, victory is that much sweeter. 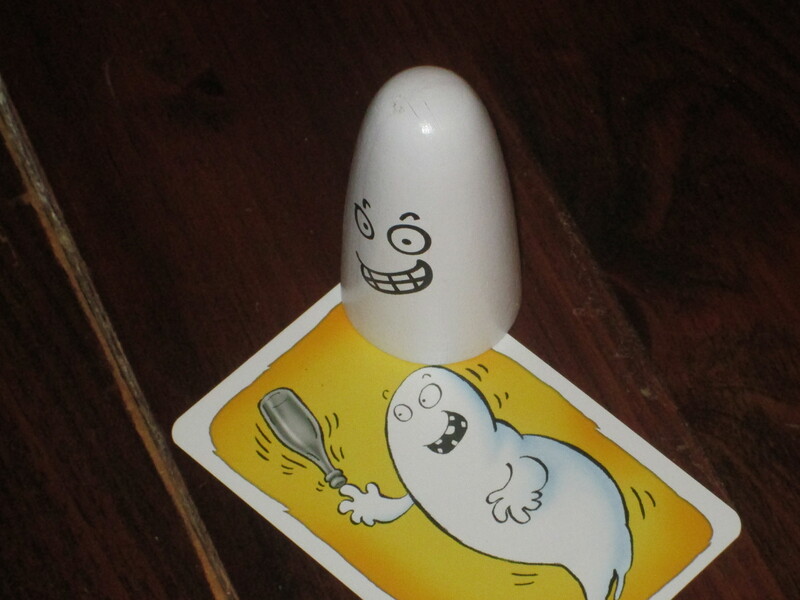 But perhaps the best thing going for Ghost Blitz is that it is just fun–pure and simple. It’s not a strategic game; it’s a game that rewards quick thinking and impulse grabbing. And because of this, it lowers players’ guards, because most of us aren’t that great at this, or at least aren’t good enough to be right every time. It’s fun to see children beat adults. It’s fun to gloat one round only to grab the wrong piece the next. (It’s especially funny when one player gloats and has grabbed the wrong piece.) There are moments of misplaced confidence that keep players from recognizing for five to ten seconds that the wrong object was grabbed first, followed by a mad dash for the right object. And, of course, there are rounds where almost everyone, it seems, has grabbed the wrong thing, and the player who snatched the right object cleans house. 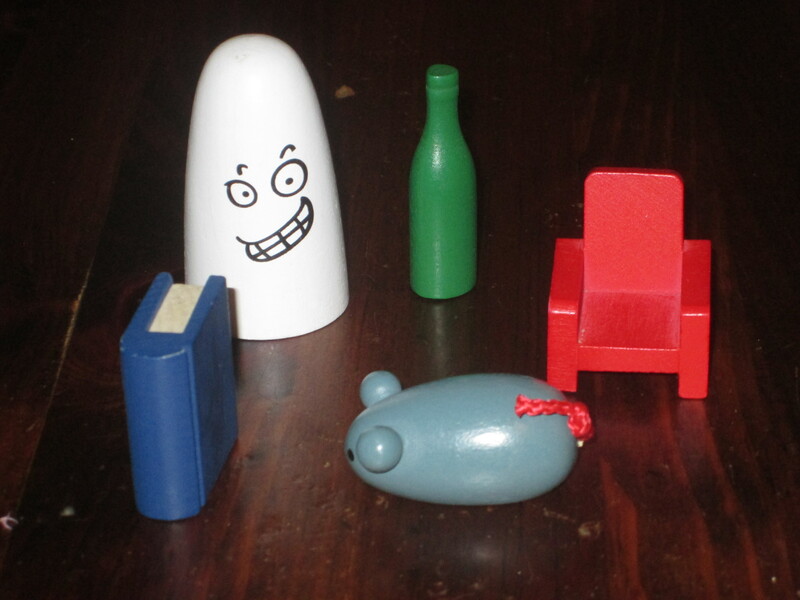 Ghost Blitz is lighthearted and tons of fun with the right crowd. As I mentioned at the start of this review, however, speed games are especially susceptible to finding “the wrong crowd.” Not everyone likes games of reflexes and recognition, and Ghost Blitz, charm notwithstanding, is decidedly a game in this camp. As such, it is a game that reveals a skills chasm between players. Players who are naturally faster at reading a situation will generally perform better than players who aren’t. If players are super competitive and don’t like to lose, it can drain the game of fun. But in most of my groups, if players are just interested in having a good time, Ghost Blitz will satisfy them. And Ghost Blitz is the kind of game you can get better at. Whenever I introduce new players, I usually make them play two games (they go fast anyway). I’m normally able to fend off all comers in the first game with ease; the second, third, and fourth games? Much more difficult. Ghost Blitz allows for two to eight players at the table. I’ve not yet played with more than five for logistical reasons, but I’m eager to–this game thrives on the energy of the group, so my guess is that the larger the group is, the more energy will feed into the game, similar to the gigantic games of spoons I played in high school. The box recommends the game for ages 8+, and this is probably apt. My eight- and ten-year-old niece and nephew grasped the rules of the game, although it was still hard for them to stay competitive against adults. (They eventually resorted to just grabbing an object and hoping for the best.) 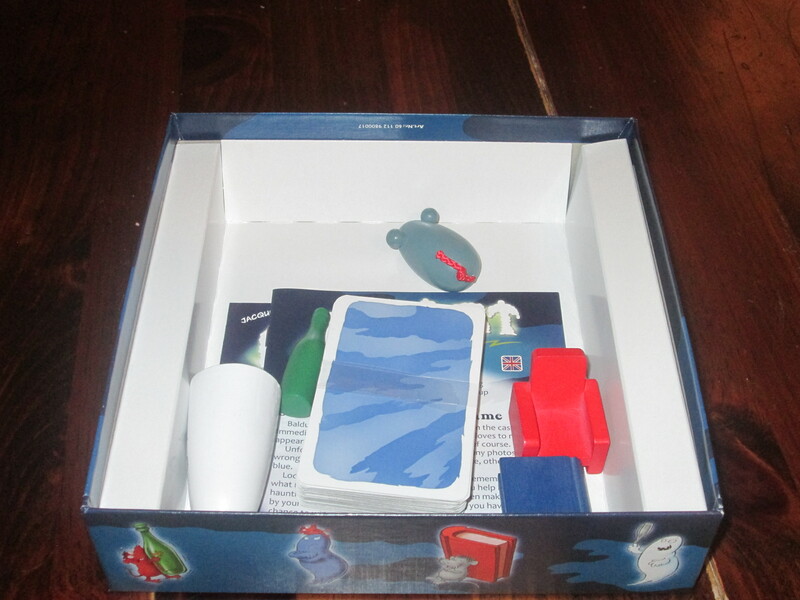 The game box is a bit deeper than the Kosmos 2-player line boxes, but you can fit everything necessary for Ghost Blitz into an Ultra Pro deck box. And you’ll probably want to travel with it. Yes, this box is humongous for what comes inside. An Ultra Pro deckbox does nicely for carrying the game around. Ghost Blitz is one of the better fast-reflexes games, perhaps even my favorite. Since it won’t be for everyone, I recommend trying the app for yourself before picking up a copy. But be advised: you might not be able to resist the charm of the physical game.